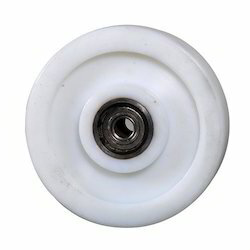 We offer our client an excellent quality range of UHMW - Polyethylene (PE) Wheels. It can be customized as per our precious customers specifications. These are widely known for its durability and quality. Load Capacity: 40 Kg to 1500 Kg. By default, UHMW PE wheels are bad coductor of electricity. The applications, where, conductive material is essential, to ground the static current generated due to process, Conductive trolley wheels of POLYTRON serves the purpose. The picture itself shows the level of conductivity in trolley wheels. These wheels are available in S-Shape & Flat-Shape in various sizes. Pacific Polymers & Engineering Co.